February 2018 - A Life From Scratch. It was a dreary day in my hometown and I was out and about picking up a few last minute things for Valentines Day. My go to spot for cards is always Angelina’s so in I went telling myself I would only purchase the few cards I needed and then leave without anything for myself. Will power, people. I can do this. Well of course I can’t do that. I was good until check out. I really was. Until I noticed the most darling and dainty little bracelets. I couldn’t help it. They were RIGHT THERE. You gals. I love, just love, when I stumble upon a new brand that just makes an easy gift for so many people in my life. The Little Words Project was started to just be….nice. And kind. And to remember that little words can make a big difference in your actions day in and day out. I immediately grabbed one for my mom (love) and perhaps a few for myself (family + love + be kind). And then proceeded to order a few more online, including two ‘bride’ ones for my sister in laws who are getting married this year. (They also have ‘bride tribe’ ‘flower girl’ and more in the bridal category. So stinking cute). 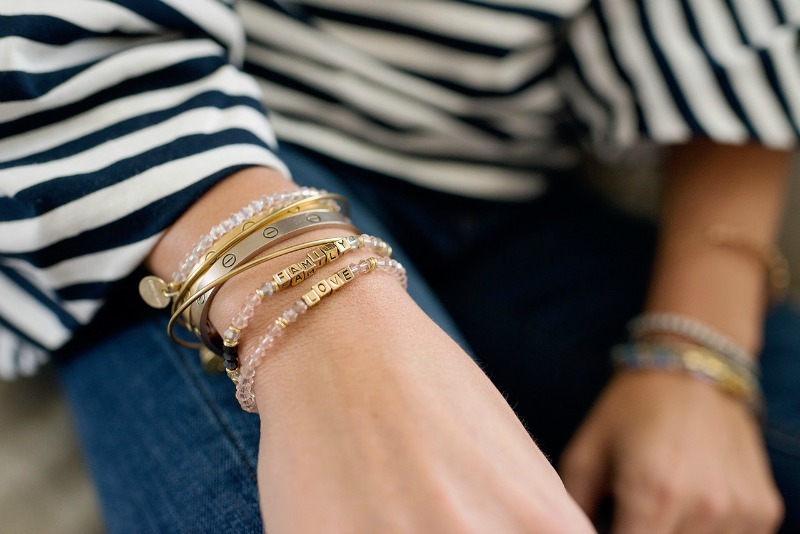 So behind what this brand stands for, not to mention the beautiful bracelets! I personally lean towards the gold letters, but they also offer white ones which would be so cute for a younger aged girl. Silver letters are also an option. All the different colors and tiny beads are so fun and easily mixable with other bracelets you may own. And get this, each one comes with a trackable code. 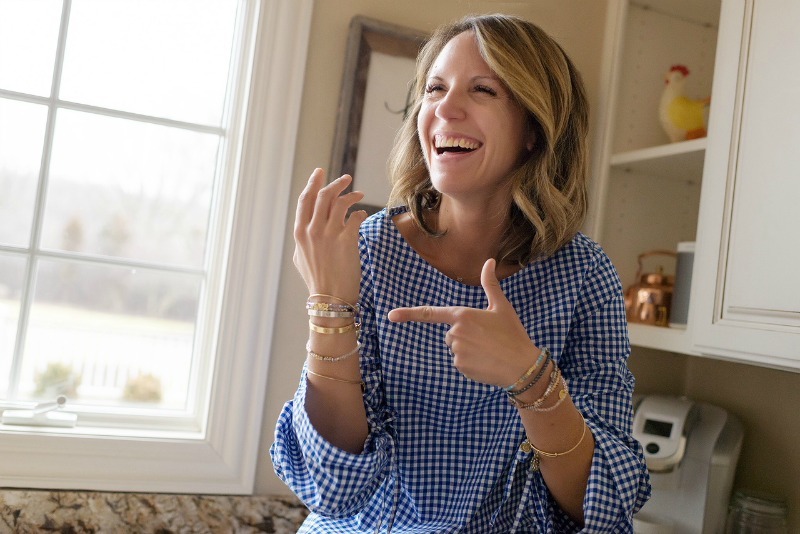 You can register your bracelet online and when you’ve felt you are ready to move on, you can share the bracelet with someone you feel could use that word in their own life…..and so on and so forth. It’s kind of neat to have the option to see how many people the bracelet reaches and of course, hopefully has an impact on. Or you can keep yours close to your heart. No judging here. These have been so fun to not only wear, but to remember what they stand for. Days after I put them on my wrist the tragic shooting at the Florida high school took place. My heart broken, I kept strong with the words I had purchased: family + love + be kind. Those words have to matter. And loving my family and all our friends hard has to make a difference in this big world, even if it is a teeny tiny difference. Also? Not going to lie. The ‘be kind’ bracelet has come in handy when I’m still getting cut off at the school pick up line. I’m just saying. Moving along, priced at $22.00 per bracelet,these make such an easy little adorable gift. And get this. For the month of March, A Life From Scratch readers can get 15% of their orders with the code ALFS15. Yippee! So spread the word my friends, these Little Word Project bracelets completely rock. And let’s stay kind to each other. Who is with me? I promise I am here cheering you all on. Yippee we made it to Friday friends! Let’s celebrate with one of our new favorite dinners in rotation around our home. 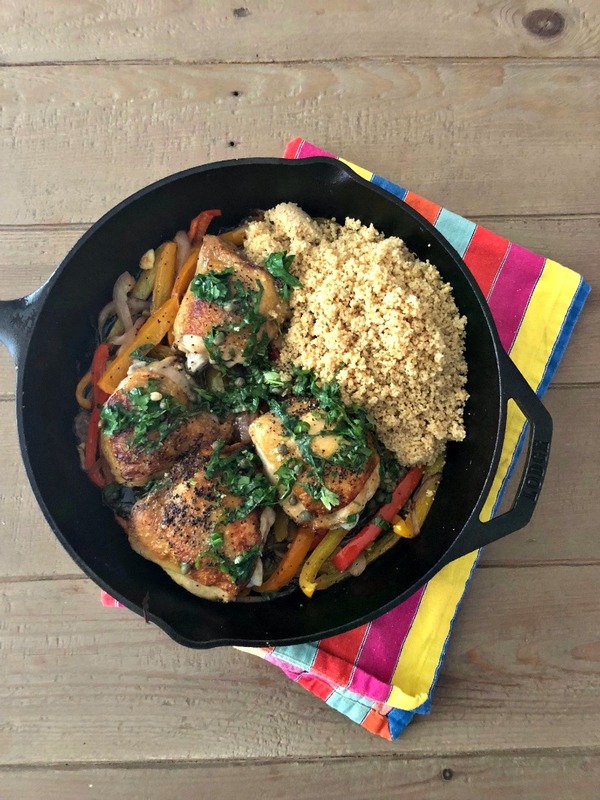 This crispy thighs with peppers and cous cous recipe is oh so lovely with fresh minimal ingredients and you get to use a SKILLET! I don’t know about you, but I just love skillet dinners. Especially when they involve bone in skin on chicken thighs, which I just have an overall obsession with. First you get to sear up the lovely thighs to get the skin nice and crispy on the outside. Then in goes a bunch of peppers and onions and garlic. On the side is simmering some garlic cous cous and then everything comes together oh so perfectly in the oven. For the cous cous, I just used the boxed variety that comes together in like five minutes, couldn’t be easier. To make it all even better, on the top goes a fresh caper salsa verde. I actually don’t really like capers, but in this dish mixed up with all the other herbs in completely works. You can make this salsa earlier in the day and it can hang out in the fridge if that helps with the dinner time madness. This is a great family meal that comes together fairly quickly yet is a little elevated for that something special feeling. Perfect to celebrate a Friday night after a long week. Preheat oven to 425 degrees F. Cook cous cous according to package directions. Heat oil in skillet over medium-high heat until very hot. Sprinkle chicken with salt and pepper. Place chicken in skillet, skin sides down, and cook 10 minutes or until skin is browned and crispy. Turn chicken over and cook 4 minutes. Transfer chicken to a plate; discard drippings. Sauté peppers and onions for a few minutes, until softened and slightly browned. Stir in the garlic. Arrange chicken on top of peppers, skin sides up. Bake at 425 degrees F for 10 minutes or until done. Meanwhile, make salsa (or this can be done earlier in the day). Stir together parsley, basil, cilantro, green onion, olive oil, capers, and lemon juice. Season to taste with salt and pepper. Fluff couscous with a fork. Serve chicken and peppers on couscous, and top with desired amount of salsa verde. 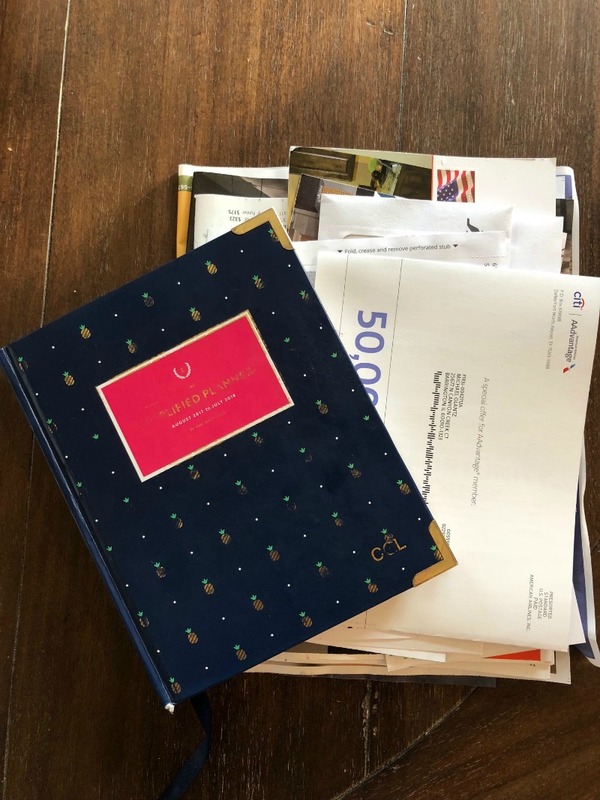 My sweet friend recently forwarded me an article about what organized people do daily to keep a tidy home along with the humorous note, ‘you do all these things. I do none!’ Ha. It really got me thinking about the routines and steps I do religiously (almost) every day to keep my home in the shape it’s in. I often get asked on Instagram how my home is always so clean. First of all, it’s not always so clean. But I did begin to really pay attention to what I do around here day in and day out to keep things in order. 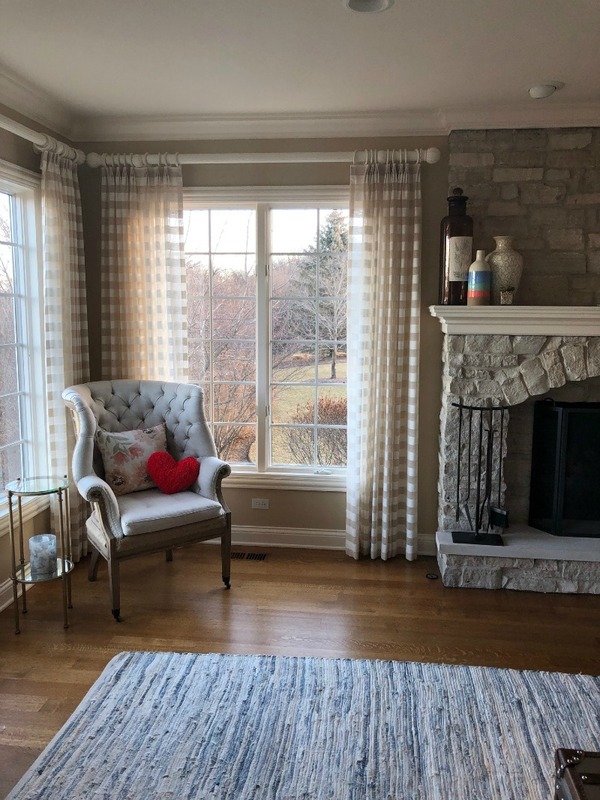 These are little routines that takes just a few minutes each day that I believe really make a difference in a home. Without further ado, my seven daily habits for a tidy home. 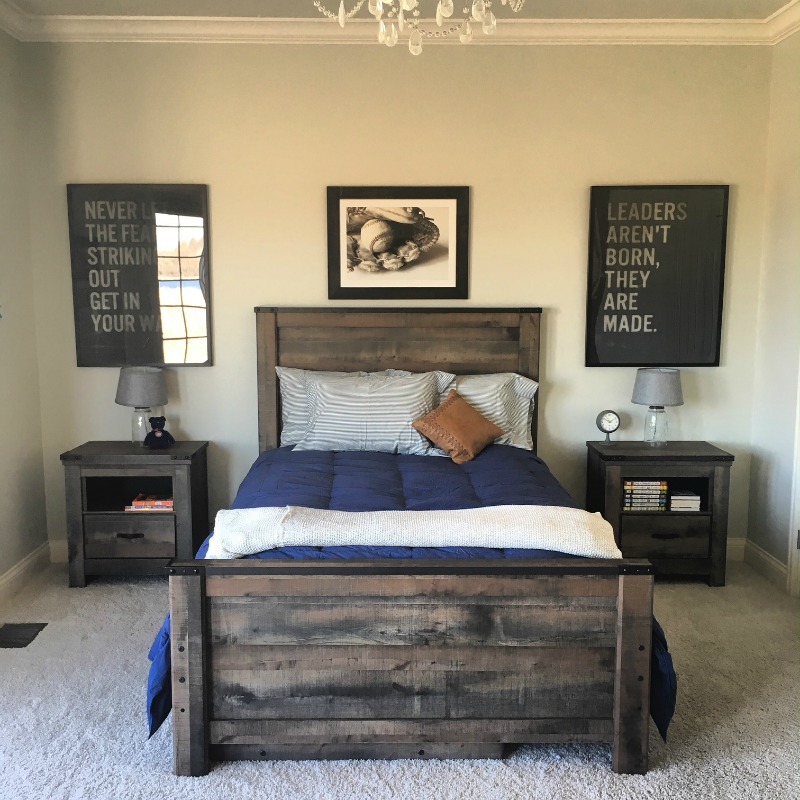 I make all beds every single day and I make them early in the day, like around 7:45AM right after my boys get on the bus. This really gives a home a ‘drop on by anytime’ sort of feel and it takes me all of ten minutes total. I just feel happier and ready to start my day when this is done. I know I preach this one over and over on Instagram but I’m a firm believer. I generally can skip weekends if I keep up with my Monday through Friday routine so that’s always nice. To be clear, laundry everyday means washing a load, drying a load, and putting away a load. I also start this early in the morning, around 7:30 or so, and most of the times it is washed, dried, and put away before I leave the home. If not, it’s (almost!) always put away before school pick up, which is at 2:40. This can be painful in the dead of winter when I legit don’t want to walk to the mailbox (ha!) but I swear getting the mail, opening the mail, and dealing with the mail every day feels super efficient. And I don’t just open it, I do what needs to be done with it. If there is something that needs to be handled (a call to be made about a bill in question, an insurance renewal, a tax form, etc) I either accomplish it same day or I direct to the appropriate day/person that needs to handle it, i.e. a later date in my planner or Mike. I handle most of what comes in, I’d say 90% or so. Tax stuff and investments head to Mike’s desk, thank you very much. Keep up with the Fridge. 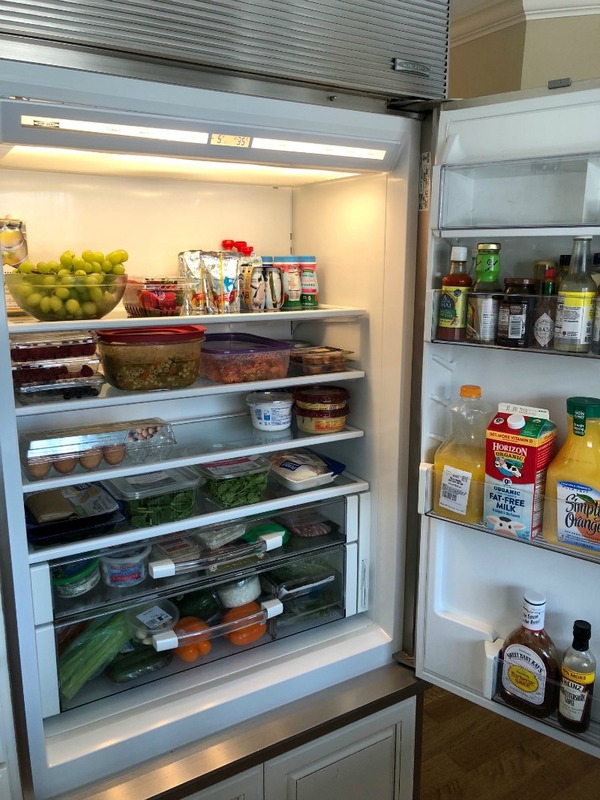 We all know my love affair for the weekly fridge clean outs (Sunday is my day), but in general day to day I am tidying and organizing as well. Dealing with the leftovers, throwing away the rotten pepper, saying goodbye to the chicken stock that has 1/2 an ounce left. (WHY). By the time Sunday comes around there is no major clean up, it’s more about analyzing what I need to restock and just giving everything a nice wipe down when it’s pretty empty. Cleaning the kitchen in the morning and evening. I give my kitchen a lot of love just because I am cooking so much and always messing it up. And I feel like a much happier person when my kitchen is clean and wiped down. 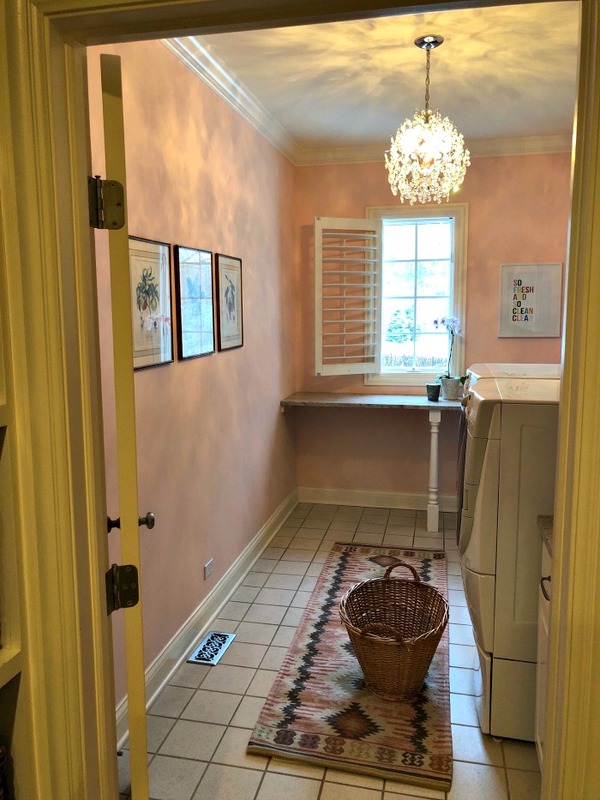 In general, I have a clean kitchen before I leave in the morning (breakfast dishes put away, any cookware drying from the night before put away, etc). 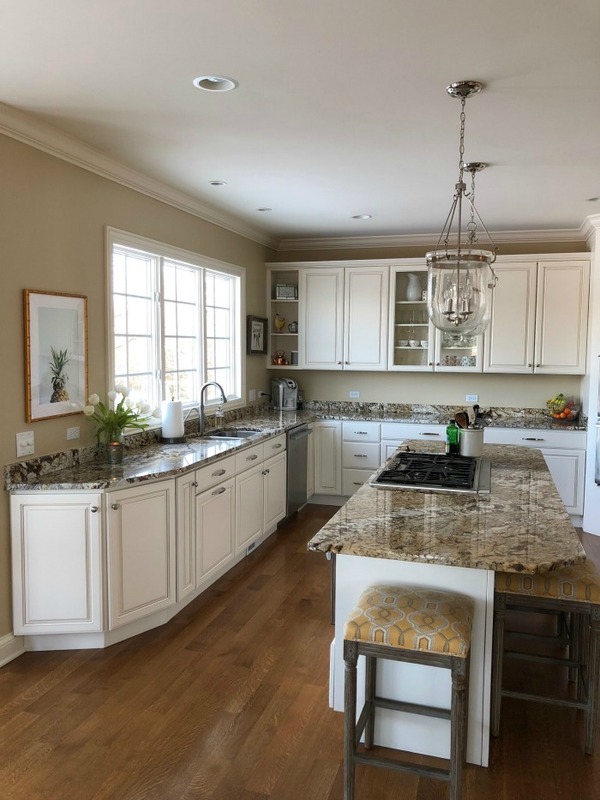 Then in the evening all dinner dishes are loaded in the dishwasher, cookware is washed and left out to dry, and the counters are wiped down for a fresh start in the morning. I love waking up this way. Repeat after me: you control the toys. They do not control you. YOU own your home. Not your kids. Let’s take it back, shall we? Now to be clear, our toy situation is not perfect. Our play room is a hot disaster most days a week and this is not a space I keep up with daily and that is OK. 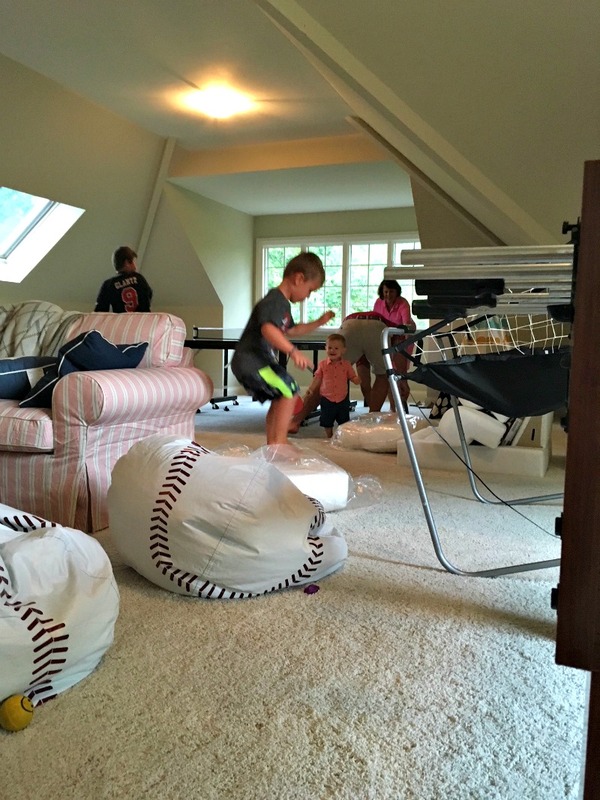 In playrooms and basements, especially with younger kids, things can slide. BUT. I do feel the main living space (the adult area!) should not be overrun with toys. How do I keep this from happening? Well, I love our massive ottoman that has great storage in it. Toys are organized in baskets in those drawers. If the boys want to play, that’s great, but they can take out one type of toy at a time (legos, trios, blocks, cars, etc). If they pick cars and are bored two seconds later and want trios, the cars must be put back first. I’ve always taught this, ever since they were teeny tiny. I also think it helps focus them on one thing at a time. When there are a million pieces of toys they get overwhelmed too! So yes, main living area toys are 100% picked up and put away daily. 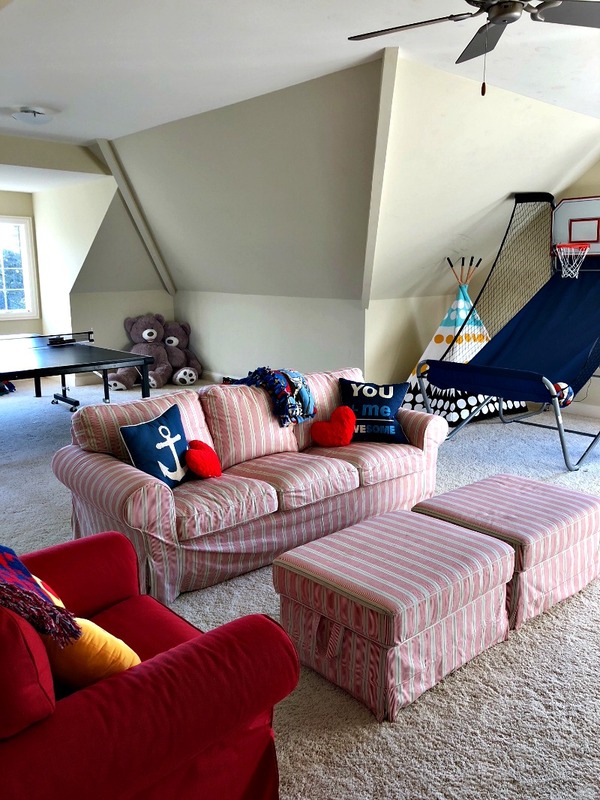 The play room and/or basement I have the boys handle roughly weekly. Get your bag/purse/back pack(s) situation under control. 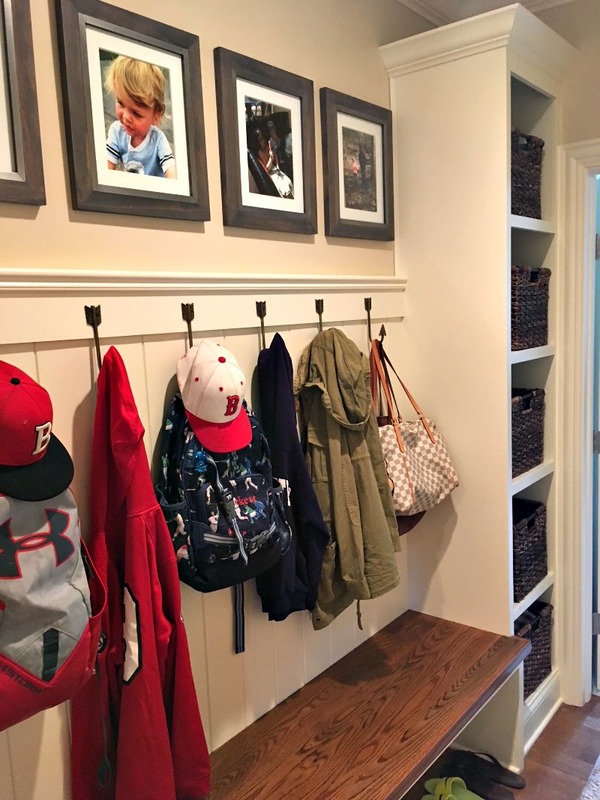 Your daily bag and the kids backpacks are a huge part of how things are run day in and day out so I believe it’s super important to keep them organized and clean. I try to deal with trash, receipts, weird gross stuff from the kids, etc daily. (I have a bag for trash in the car and this has been a life changing tip!) I also keep my essentials (hand sanitizer, Advil, band aids, chapstick – etc) in a clear zipped bag for easy access and organization in my own bag. I know this one can be a pain, especially with the younger aged children who need all the things all the time, but I swear it makes the day to day less frustrating. Lastly? Handle all of this with grace. I tend to take a step back on days that just get away from me or even seasons that may (ahem, baseball) and remind myself that my home does not have to be perfect. It is not a reflection of who I am personally if I still have laundry to be folded in the dryer and messy counters and legos laying about. It’s funny, when I went to search for a closing photograph of a messy room in my home I had very little. Funny how that works, right? We just really like to share the pretty stuff. A much needed reminder to me that even messy moments are important to document and showcase to keep this space as authentic as I possibly can. Chicken nuggets, french fries, grilled cheese, hot dogs, pizza, peanut butter and jelly. Oh wait, can’t forget the $37 filets when we go out to dinner. I’m going to be extremely transparent on this post because I get this question asked almost daily and I want to be very clear and honest about something. My boys are not eating what I cook every day. And (GASP!) I am ok with it. Look, I know dinner can be an extremely frustrating time for families for many reasons. Busy schedules and picking eating I’m sure are at the top of those reasons. And I know, it’s not fun to be a short order cook. Making multiple meals each night just seems to be enabling the picky eating problem, right? Yet I don’t know. I sort of view it differently. 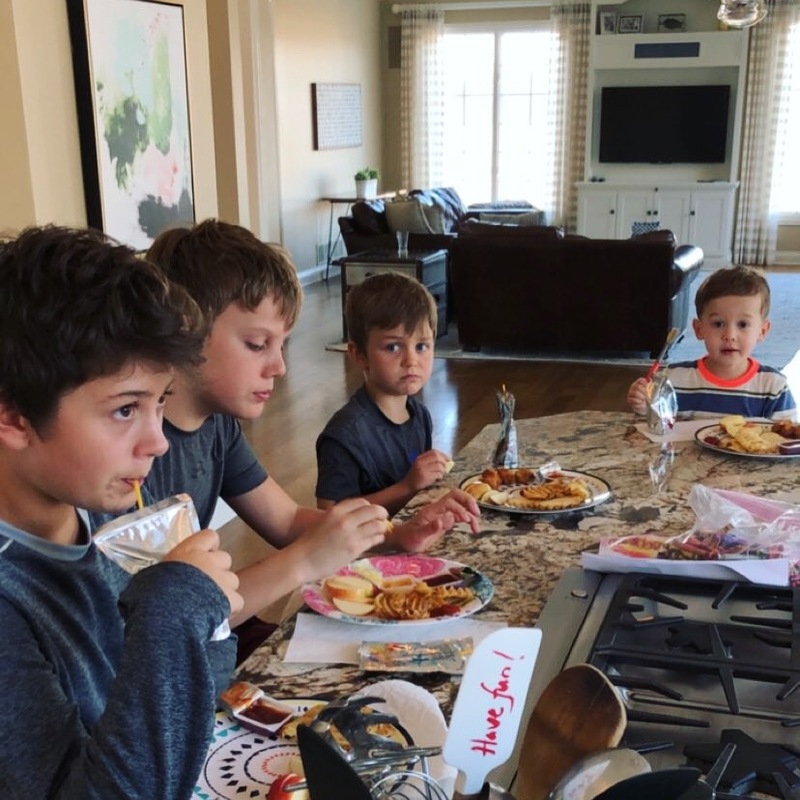 Maybe I’m navie, but I’m hopeful that if I keep cooking different flavors with different ingredients and my boys see that, smell that, and at times even taste, that alone is progress in of itself. I know many people grew up with their mom making only one dinner, myself included. Yet I think a lot of the way we eat has changed now. There was no Pinterest crazed moms back then, right? My mom is the most wonderful cook in the entire world but we grew up eating eating meals that leaned way more kid friendly than not. So I think there is a gap here. A gap in which some of our kids need time to let their taste buds grow into the way we cook now. And, rather than get frustrated by it all, I just accept it. There is something freeing in that. Just don’t expect them to try or eat the salmon power bowl. Everyone is happier, I promise. And hey, if you have littles that gobble that type of stuff up more power to you! But how do I handle feeding my boys? Making multiple meals each night? So I’m on the clock from pick up (2:40) on. I view feeding them just apart of the job. They are starving after school so I generally make a heartier snack then. Most of the times they are at an activity around actual dinner time so I am cooking for them before they go. If it’s a meal I’ve made for the whole family that they will enjoy (everyone loves this) I will serve that. If not, I just keep things on hand that I know they will always eat and love. Sliders are a go to fav. Italian sausage. Rotisserie chicken. Tacos. None of this is hard to heat up and/or cook. It takes all of ten minutes, tops. They are happy and well fed before sports and I can eat a dinner that I want to eat. 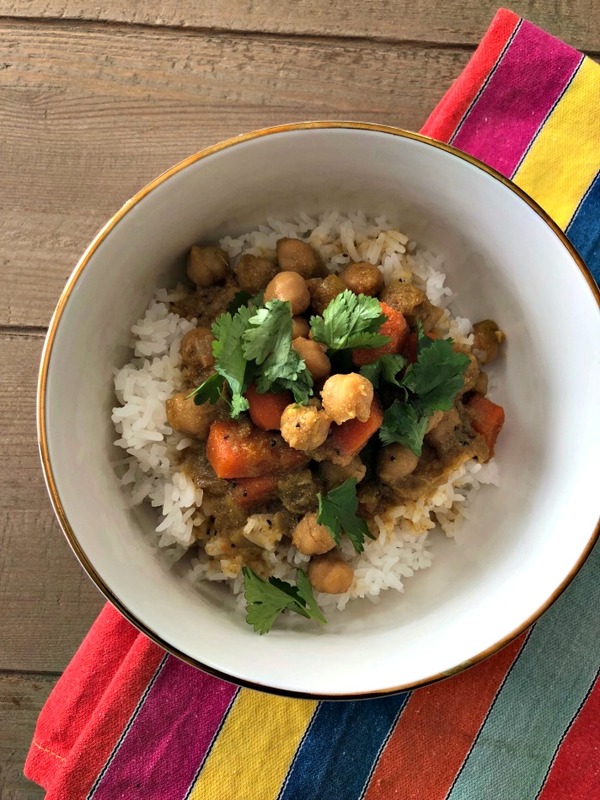 Like this coconut chick pea curry. I promise you it’s worth heating up sliders for your kids over, or heck even driving through Culvers. We do not judge here. 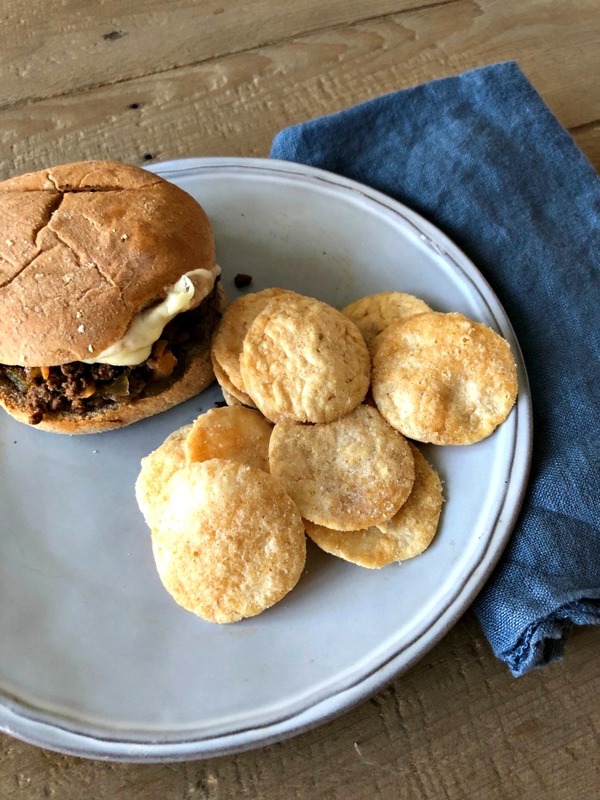 Make this if only for yourself as it is completely worth it and SO EASY that it’s not annoying at all that your kids probably may not touch it. Heat the oil in a large nonstick skillet over medium heat. Add the leeks, onions, carrots; cover and cook 5 minutes or until tender. Add the curry powder, sugar, ginger, garlic and lemongrass; cook 1 minute, stirring constantly.